If you are curious to know the culinary preferences of the olympic athletes, here’s a privileged way: through Nicola Batavia’s blog (in Italian). 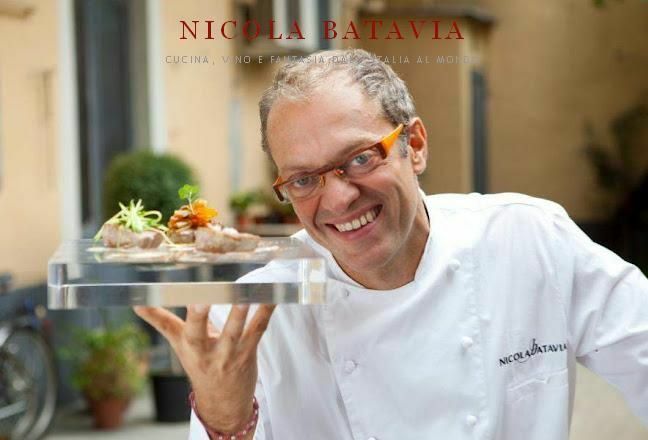 Head chef of the renowned Birichin restaurant in Turin, Batavia has been chosen by Nike to run the Nike VIP Lounge, for the third consecutive time, following on from Turin in 2006 and Beijing in 2008. An eclectic, original chef, who has won – and turned down – a Michelin Star, Batavia has created a blog-spot where he recounts his daily experiences and meetings with athletes from all over the world. Unfortunately, ordinary folks – like you and me – are not admitted to this heavenly place, which is dedicated to athletes sponsored by Nike, who decide to enjoy their lunch in downtown London rather than at the Olympic village. However, if you happen to be in London, you can have a taste of Batavia’s talented cooking at his own Casa Batavia restaurant. Or you could go to Turin, as I did last winter, to experience a meal at his Birichin restaurant, one of my best meal ever.